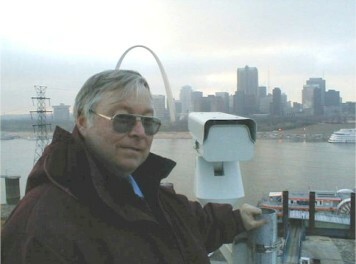 Robert Madoux surveys the St. Louis skyline. Who's that man behind the curtain? In this case, it isn't the Wizard of Oz, but Robert Madoux of KMOV-TV Channel 4, the CBS affiliate in St. Louis, Mo. He may not live in the Land of Oz, but he truly is a wizard with literally hundreds of miles of audio cable that snake their way through the television studio, parking garage, and up transmission towers. Madoux has worked at the station for 36 years. Though his SIUE major was Mathematics (B.S. '70), Madoux had a Biology 201 closed circuit class when he was a sophomore. That class captured his interest in broadcasting. His next step toward a career in broadcasting was landing a job in broadcast services on campus. Madoux actually threw the switch the first time WSIE-FM radio made its maiden broadcast on Sept. 4, 1970. He looks back on that as a special memory, and one that no one else can claim. 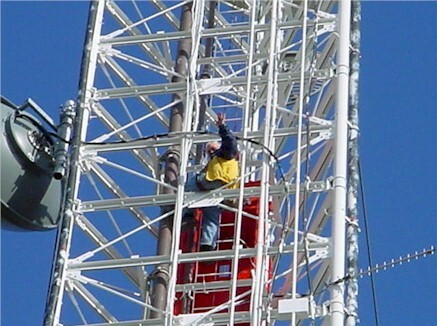 Madoux has done repair work on KMOV-TV satellite towers that are located throughout the region, such as Alton, IL; Columbia, IL; South St. Louis County, and St. Louis Lambert Airport. He himself climbed the 1,000-foot towers in his younger days, but now leaves that to someone else. The picture of Madoux below shows him waving from a tower 100 feet in the air. Through the years, he worked his way up at KMOV. His previous jobs have included installation of high-power TV transmitter that took six months to install at the South County transmitter site. He held the position of master control supervisor for 12 years. Today, he focuses on audio maintenance, which includes modification, installation, and trouble-shooting of all audio microphones, the paging system, and intercom system used by directors, producers, and other specialist at the station who synchronize television programming and commercials. "If the sound goes out," said Madoux, "I'm the one they yell for." Then it's up to him to determine if it is an operator error or a problem with equipment or wiring. He remembers a time in 1973 when Regis Philbin did a weekly Saturday night show in St. Louis. Madoux also did small parts in the production of "What I Want to Be When I Grow Up," which featured kids of about 10 years old. He did the taping of the sound for the programs. Since walking in the door of KMOV, Madoux has seen the industry change from film to video and now from analog to digital, This last year has been hectic with the change from analog to digital, requiring Madoux to update the plant within a short period of time. He remembers when all the film had to be shipped by courier to the station for programming. With the advent of satellites, all that changed. Servers now take the place of couriers. Madoux will be 62 this year, but he isn't considering retirement quite yet. He likes to problem-solve and his job allows him to do that. He looks forward to each day at work because no day is ever the same. According to Madoux, "Life is as an adventure that has allowed me to learn." His wife Mary Lou studied radiology at DePaul Hospital, and has worked for St. Mary's Hospital in Clayton, MO, for the past 40 years. His two daughters both graduated from SIUE. Amanda Madoux received her B.A. degrees in Spanish and Geography in 2003. She is currently working on her master's degree in foreign affairs, and works at the National Geospatial-Intelligence Agency in St. Louis. Sara Yeager, who graduated from the SIUE School of Business in 1999, works as an account executive for Zenith Media. His brother David Madoux also received SIUE Chemistry degrees (B.A. '77; M.S. '79). He currently works as a chemist in Texas. One of his other past hobbies was amateur radio operation. He particularly loved "Fox Hunts," where a transmitter (the fox) would be hidden somewhere in a designated 10 mile area. Teams would try to locate the "fox" within that 300-400-square-mile area. Madoux took piano lessons as a child, but quit when he reached high school, saying that it wasn't "cool." He still plays for enjoyment, regularly learning new songs, such a ragtime piece or a classical march. Madoux is also interested in bicycling on the various trails in Madison County. He has ridden multiple times in St. Louis' annual Moonlight Ramble through downtown and the highly caloric "Tour de Donut" in Staunton, Ill. Not being satisfied to just ride the trails, he has researched the old trolley and railroad lines that have become part of the bicycle trail system. "Life will talk to you; you just have to know how to listen," explained Madoux. He likes to help people learn to deal with problems by figuring creative solutions. "I love to see that 'spark of understanding' when I'm guiding a colleague toward a solution." he explained. He feels fortunate to have been able to take some additional training in California, Nashville, Lewis & Clark Community College, and St. Louis Community College through the years.